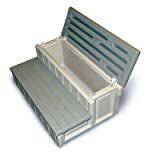 The Confer Plastics HS2MR steps for round or square tubs are a great choice if you don’t need any storage in your steps. They also come in at a lower price point but are still quite sturdy. Beware that the assembly for these is a bit of a bear. For more information on the Confer Plastics spa steps, see below. The best option if you’re not going with either of the above hot tub steps is Cover Valet’s line of hot tub steps. With a standard 300 pound weight capacity and simple look, they strike the balance of being just what you need while keeping it simple. These steps are functional and durable without any extra frills, like a storage compartment, while having the basics like an anti-slip design. If you are unsure of what hot tub steps to buy, these are overall a safe pick. Many have difficulty putting spa steps together. The plastic pieces usually don’t need to be fastened, but getting it all to fit together can be surprisingly difficult. If you have a rubber mallet, the assembly will be easier. You can hit them pretty hard with a rubber mallet without damaging the material, which makes things easier. A regular hammer will likely damage the plastic. If you don’t have a mallet, try inserting the back of the step into the step so that it sits like a partly-opened box. Then step on the front of the step with your foot (be sure to have something to hold onto) and put all your weight onto it. With that, the step should snap into place, and you should be good to go. When shopping for the best hot tub steps, it’s essential to keep a few things in mind. Firstly, it’s important to look at durability and construction, along with the type of material that they were made from. Durability is important since they will be used frequently and you wouldn’t want any family or guests getting hurt on the off chance that they crack or break during use. An anti-slip design is also important given the slippery nature of hot tubs. You’re going to be wet when you use these half time you’re no them, so having some slip protection is important. Additionally, consider a hot tub handrail for additional safety. And finally, longevity plays an important role and is helped out by factors like whether or not your steps are UV resistant or weatherproof, as it can extend the lifespan considerably. In this section, we’ll look closely at several different options for hot tub stairs, and compare and contrast them. We’ll start with a comparison table to get the lay of the land, and then go in detail on each. In the end, we’ll sum up our findings. The first set of hot tub steps we review sets the standard for those to follow: great durability, an anti-slip design, and a variety of colors to match any hot tub. Warranty Policy: Contact Cover Valet Directly. See this link. Cover Valet’s spa side steps are durable and relatively easy to assemble. This is certainly a plus when it comes to hot tub steps, as you’ll see some of the other brands can be a bit more difficult to put together. Surprising for such a simple item! It’s worth noting that while grooved, these don’t offer as much tread as some of the others, which is a concern when you’re all wet. The well-built nature of these steps lends to an aesthetically pleasing look , which should go well with any hot tub (especially given the four color options). Cleaning is simple, as a simple soap and water solution should do the trick. Consider storing them in the garage or shed during periods of time where you won’t be using your hot tub in order to keep them from enduring additional wear and tear from weather. With a simple design, budget-friendliness, and variety of color options, Cover Valet’s spa side steps are a suitable option for any hot tub owner. 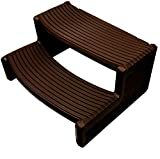 They are best compared to Confer’s hot tub steps which we’ll review next. The most popular option of choice when it comes to hot tub steps, these may be a little bit harder to assemble, but their strength is long lasting durability and versatility. Contact Confer Plastics directly for more information regarding their warranty policy. The first major consideration before considering these steps is how adept you may be at typical furniture assembly. A number of buyers have found these steps difficult to assemble. The biggest issue people run into is snapping it together, which can take a lot of force to make happen. By using a rubber mallet, you’ll have a much easier time of getting them attached. See our comments on assembly above. Durability-wise, these may be the strongest hot tub steps of the bunch, capable of supporting up to 350 pounds. They’re also pretty robust and will last a long time outdoors. The best part is that these hot tub steps are among the lower-priced options, making them suitable for those who aren’t looking to spend a ton of any extras but rather just want simple, solid steps. Most importantly, these steps can be assembled in a way that they can be used with either straight-sided or round-sided spa sides. The versatility should help ensure they can be used in a variety of settings. Once you get past assembly, these hot tub steps are going to last a while and are one of the best options available online. They are very similar to the review that came before them as well as the to follow, so ultimately your choice may come down to preference. The ability to fit any hot tub is definitely welcome, as hot tub owners won’t have to worry about whether or not the steps will align with their specific spa. They’re a pretty good choice for round inflatable hot tubs. If you’re worried about assembly, these may be the easiest of the bunch to put together – and go great with almost any hot tub with their dark brown color. Contact VirtualSurround directly for more information regarding their warranty policy. VirtualSurround’s hot tub steps are similar to the previous two which feature the ability to assemble it with straight or rounded edges, fitting most hot tubs. They also share a plastic material profile, though these may be a bit easier to put together. Once again, the norm will be to keep them inside during periods of inactivity or inclement weather as to help keep them in good condition for as long as possible. Other than that, the norm for hot tub step cleaning applies. The basic care consists of a simple soap and water cleaning every couple of months. Be sure to check that they’re flush against the side of your hot tub, and that you’ve used the right assembly (round-edge for rounded hot tubs), and so forth. Otherwise, these hot tub steps don’t really have any distinguishing features that you might find in the other ones at a cheaper price. While being very similar to Confer Plastics and Cover Valet, there’s little to make these stand out among the other steps on our list. With a removal storage compartment, these offer a little bit more than your standard spa side steps while being similar to the previous steps. Confer Plastics other hot tub steps, the Leisure Accents, are a little more on the high-end side, boasting a few extra features, although also a higher price point. Similar to the previous hot tub steps, they have an all-plastic construction, are weatherproof and UV resistant, and are easily cleaned with soap and water. Where they differ, however, is the addition of a removable storage compartment built within the steps. It’s not recommended to store hot tub chemicals in the storage compartments, as they may get wet. That said, some do store spa chemicals them in sealed, waterproof packages under the steps. These storage areas can be useful for towels, toys, or other supplies for guests to have readily on hand. These spa stairs come in at a bit heavier than most, at 25 pounds, which will lend to their feeling of durability and resilience. If you are finding yourself needing the extra storage compartment, then the built-in feature found in these hot tub steps may make these steps worth investing in. These are largely just a luxury upgrade from Confer Plastic’s H2SMR steps which we reviewed earlier – with no real functional difference. If price isn’t an issue and you want the extras, then these steps are for you. Otherwise, any of the other hot tub steps will achieve the same results – helping you get in and out of the tub safely – while at a better price. Hot tub steps are made to serve one purpose – help people get in and out of the hot tub safely, largely through a durable construction, anti-slip design, and being flush against the tub. Some people also find them useful for other purposes, like getting in and out of bed, or using them as a simple stepping tool. Whatever your purpose, you want to make sure the steps you purchase will be long lasting, safe, and not prone to construction faults that can leave someone injured when using them. All of the hot tub steps we reviewed pass this test: they are made of hard plastic, have no glaring weaknesses, and have a few extras built in like UV resistance and weatherproofing. However, a few stand out in particular as being particularly good: both of Confer Plastic’s steps as well as Cover Valet’s are steps that get the job done functionally while also look good enough to go with any spa. If price isn’t an issue, consider the Leisure Accents steps by Confer Plastics, which have a small storage compartment to help you keep things ready by the hot tub, like towels. Otherwise, the H2SMR or the Redwood Spa Side Step should cover the basics for everything you’re looking for in hot tub steps.